Forget special spandex clothing. Forget, too, any complicated spiritual rituals or expensive workshops. Readers of Fifty Ways to Feed Your Soul don't need any special props or instruction to find peace and serenity. Instead they get tried and true advice from people just like themselves, the readers of Spirituality & Health magazine. 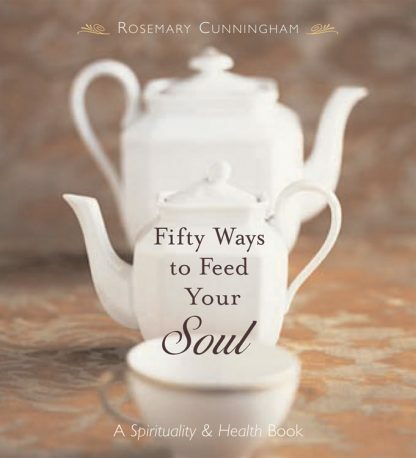 Author Rosemary Cunningham, a regular contributor to Spirituality & Health, invited the magazine's readers to reflect on their daily lives and share the simple actions that nourished their souls. Responses poured in through e-mail from around the world. Fifty of those responses became Fifty Ways to Feed Your Soul. * "I nourish my soul by watching my three-year-old daughter eat. Her enthusiasm for life is contagious." * "A good friend and I make time once or twice a month for a Girls' Night Out." * "I start my day from a 'heavenly' perspective by visiting a website that posts photographs of the cosmos." * "I use a black-paper spiral notebook and cut out pictures from nature magazines of peaceful scenes and create my own inspirational prayer book." With black-and-white photos throughout, Fifty Ways to Feed Your Soul is the perfect inspirational--and practical--gift for anyone on any occasion.